today I will tell briefly about "The Grinch". I think we all know the Grinch...the story is really interesting and he is 57 years old now. The character was written and created by Dr. Seuss in the children's book "How the Grinch Stole Christmas!" Nine years later the story was created into a film by Chuck Jones with the voice from Boris Karloff. Dr. Seuss wrote more Grinch tales, because of the fan request in 1977. In 2000 a live-action film was created by Ron Howard. In the same year a video game was illustrated for Computer and several consoles called The Grinch. In 2007 Nintendo DS game followed. In 2006 the Grinch turned into a musical on the stage with Patrick Page acting. The Grinch was played by Jim Carrey. He had a general positive response from film critics. Paul Clinton of CNN said: "Carrey was born to play this role" and noted that "Carrey carries nearly every scene." Peter Stack of the San Francisco Chtonicle proclaimed that: "Nobody could play the Grinch better than Jim Carrey". The Grinch is a combination of Seuss's creation and Carrey's personality. I think a Christmas without Grinch, should be not exist. 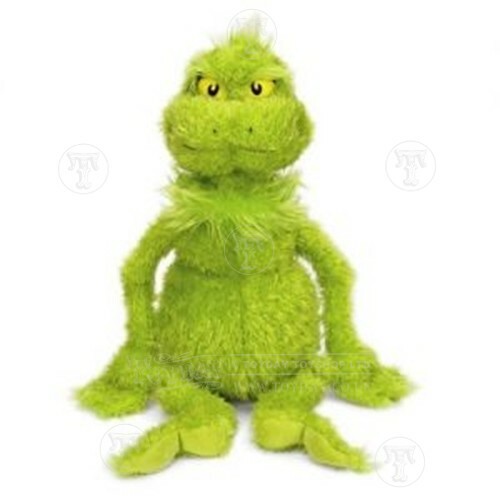 And if you want to share your bed with Grinch, you can buy this soft toy from Toyday.